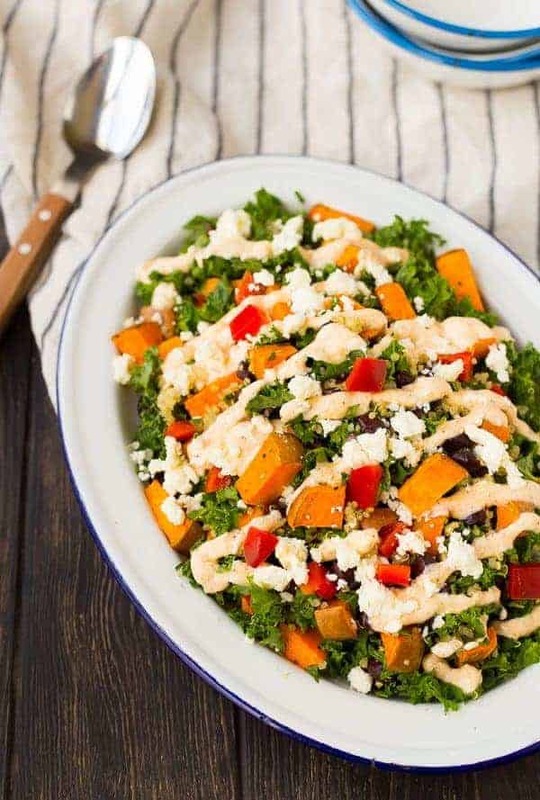 Filling and flavorful, this kale sweet potato salad is filled with southwestern flavors and nutritious ingredients! It’s great for meal prepping and healthy eating all week long. Hi, I know Thanksgiving is this week. But we have to eat something other than stuffing and turkey this week, am I right? Our Thanksgiving is going to be fairly low-key, just my parents and Ben’s parents over at our house. They’ll come over early and we’ll all cook together while we munch on a cheese plate and sip wine while the guys watch football. I almost enjoy that part of the day more than the actual Thanksgiving feast. In the days leading up to Thanksgiving, I’ll try to be a little extra mindful about what I eat. (Keyword: Try.) I’m stocking my fridge with greens and shredded cooked chicken so I don’t mindlessly eat something while I’m rushing around and stressing about the main event. This is my goal, but you know how things go. One thing leads to the next and before you know it, you’re sitting in front of the TV at 9pm eating a gigantic bowl of popcorn covered with butter. It is what it is. 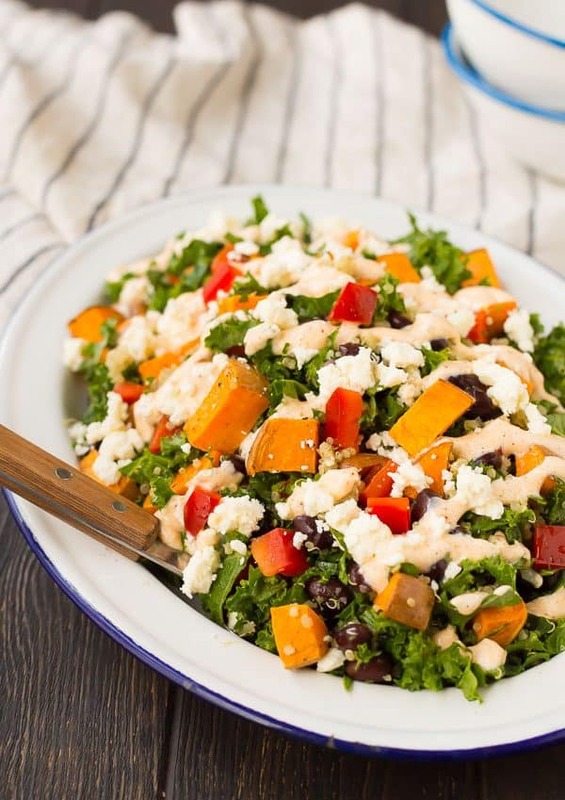 One thing I definitely plan to prep is this kale sweet potato salad. It’s easy to make and it has the southwestern flavors that I can’t get enough of. Plus, it’s great with chicken thrown on top. I cooked chicken on Sunday in enchilada verde sauce using my Instant Pot and it’s going to be perfect on top of this salad for a little added protein. However, if you’re a vegetarian, this salad packs a solid punch of protein as it is. Between the quinoa, the black beans, and the Greek yogurt in the dressing, you’re looking at about 12 grams of protein per serving (see my nutrition disclaimer though – I’m no RD!). 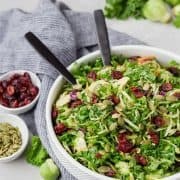 Another great thing about this salad is that you can prep it ahead and keep it in your fridge for up to 4 days. Hooray for one less thing to do this week, right? Tip: If you prep this salad ahead, you’ll either want to double the dressing recipe or reserve about half of it. My personal recommendation is both – double the amounts, and keep half off. That way you can toss a little extra on right before serving the salad since it does tend to dry out a little in the fridge as the ingredients soak up the dressing. Another great thing about this salad is that you can really make it your own. I often will use chili roasted sweet potatoes instead of plain ones to give this even more flavor. You can also top with any assortment of toppings. I already mentioned chicken, but other great additions are avocado, tomato, cilantro, green onion, or red cabbage. I hope you guys enjoy this salad as much as I do! 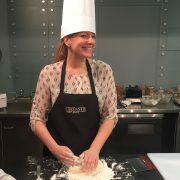 Preheat oven to 425 degrees Fahrenheit. If you don’t like washing dishes, line a rimmed sheet pan with parchment paper. Toss sweet potatoes with 1/2 teaspoon olive oil and salt and pepper. 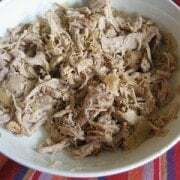 Roast for 15 minutes, toss, and roast for another 5-10 minutes or until fork tender. Remove from oven and set aside to cool. 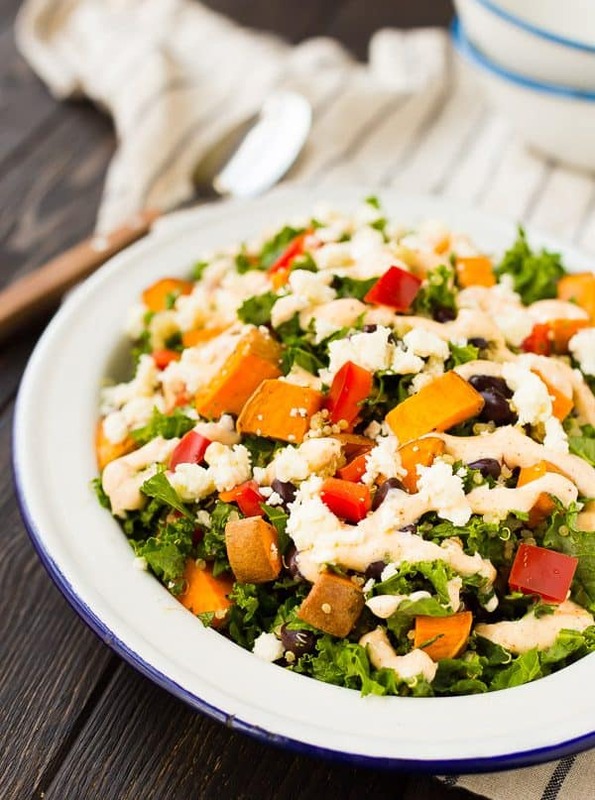 In a large mixing bowl, combine kale, quinoa, bell peppers, black beans, queso fresco, and cooled sweet potatoes. In a small mixing bowl, combine dressing ingredients: Greek yogurt, olive oil, lime juice, honey, chili powder, lime zest, and salt. 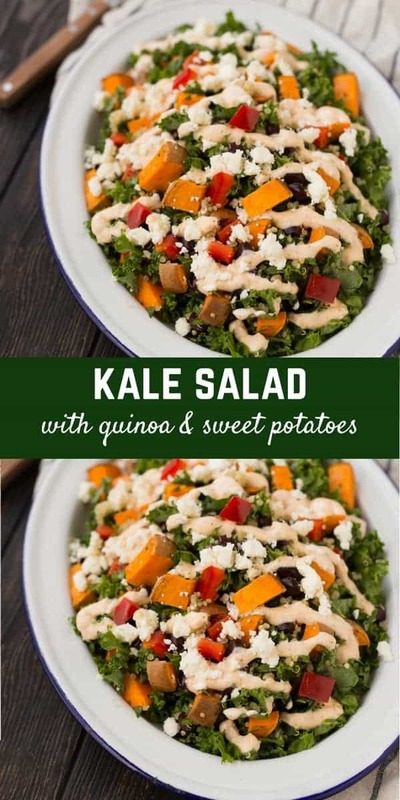 Drizzle dressing over salad and toss to combine. Serve immediately or store covered in fridge for up to 4 days. For best texture, chop kale very small. Large pieces can be chewy and small pieces are much easier to eat. If meal prepping this in advance, you may wish to double the dressing – it does soak some up as it sits in the fridge. Some great additions to this salad would be diced avocado, tomatoes, or green onions. 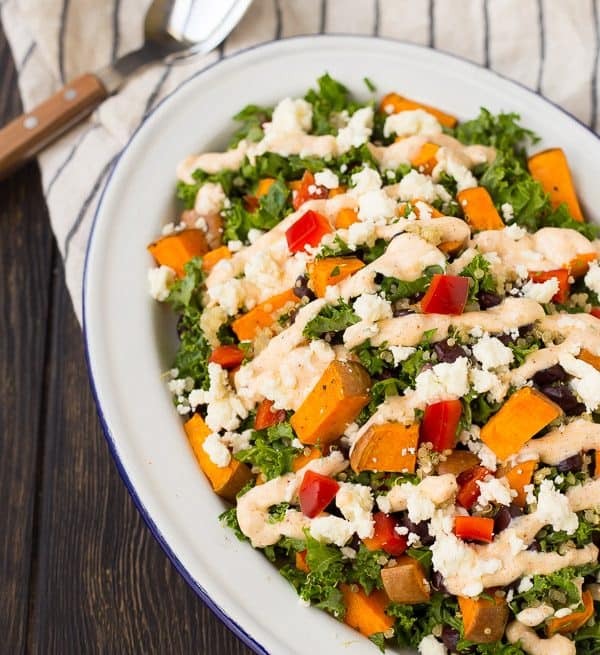 Verdict: This kale sweet potato salad is a fantastic filling and healthy lunch. Husband’s take: I mean, I get into kale salad more than Ben does, but he had no complaints about this. Changes I would make: None are necessary! If you’re looking to switch it up a little, check out my tips for fun additions to this salad. 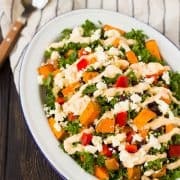 Disclosure: I have been compensated by Milk Means More for my time to develop this kale sweet potato salad recipe and write this post. All opinions are as always, my own. Find out more about why Milk Means More on Twitter, Facebook, YouTube, Instagram and Pinterest.